Congratulations to "Maurisa P.", the winner in Scarlett's giveaway. Please contact JUST ROMANTIC SUSPENSE to claim your prize! Hey, Everyone. It’s great to be back here at Just Romantic Suspense again! 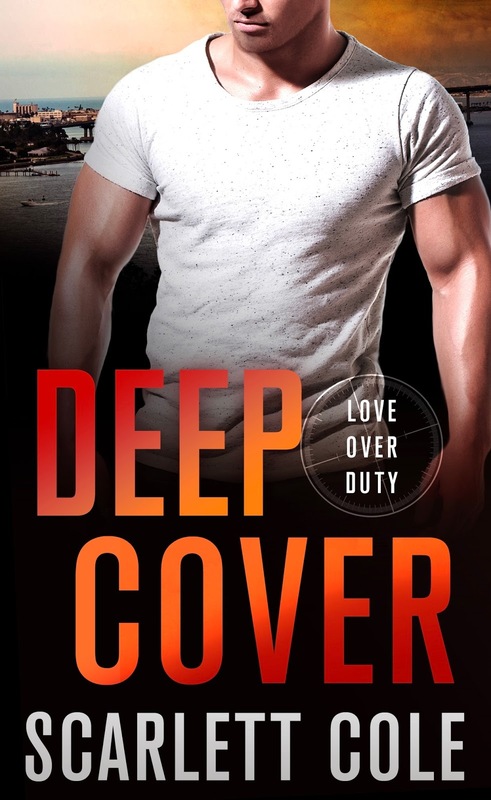 I’m super excited to celebrate the release of DEEP COVER with you all. Wow, Cabe and Amy… where do I begin? This one has a pinch of Ocean’s Eleven as ex-Navy SEAL, Cabe, is forced to work undercover in a casino alongside talented FIB agent and part-time card-shark, Amy Murray. With Cabe still recovering from his fiancée’s death two years earlier, and Amy attempting to escape the fall-out from a sexual harassment case she’d raised, neither of them have any intention of doing anything with each other, aside from their jobs. But when it’s just the two of them, the sparks fly no matter how hard the try to hold onto their hearts. It’s another fast-moving adventure for the men of Eagle Securities twinned all the romance and banter you’d expect from Six, Mac, and Cabe, especially when Six asks for their help in planning his wedding. I hope you love DEEP COVER, and take Cabe and Amy to your hearts. Scarlett will be giving away a $10 Amazon gift card and a Love Over Duty ebook of choice to one lucky reader leaving a comment or email entry. Giveaway ends 11:59pm EST August 3rd. Due to GDPR regulations you no longer need to submit your email address in the comments. If you have been selected as a winner your name will be posted at the top of the post. You may then contact maureen@justromanticsuspense.com to claim your prize. Your email address will be shared with the author/publicist providing the giveaway. Congratulations, Scarlett, on your new book! And, enjoy your celebration. Sounds good.... thanks for sharing! I will definitely be adding this book to my TBR list! You had me at SEAL and Ocean's Eleven. Got to love Navy SEAL (even former SEALS) stories! Congrats on the new release, Scarlett! Congrats on your new book release, Scarlett. The story sounds great, like something I’d really enjoy reading. Looking forward to it! Congrats on the release, sounds like an amazing read! Getting over the loss of someone you love varies from person to person. In Cabe's case, keeping busy with work seems to be his way of coping. Filing a sexual harassment charge is a sure way to put yourself in the crosshairs of scrutiny and ridicule. You can become a pariah to coworkers. It will be interesting to see these two characters work together and work out their relationship.